Maureen Palmer, and her colleagues at NASA, discovered the presence of a complex molecule vinyl cyanide more than 200km up in Titan’s atmosphere, and believe it could provide a key ingredient for life: cell membranes. Cell membranes are barriers formed from carbon-based fatty molecules, called lipids, which serve to protect a cell from the environment, and are thought to be crucial to life. On Earth, these lipids require water to form, but all the surface water on Saturn’s moon Titan is frozen. Given the average temperature of 94K, or -179.15 °C, this is not really surprising. Titan does have lakes and seas but they are made from ethane and methane. Lipids aren’t stable in ethane and methane at sub-zero temperatures. 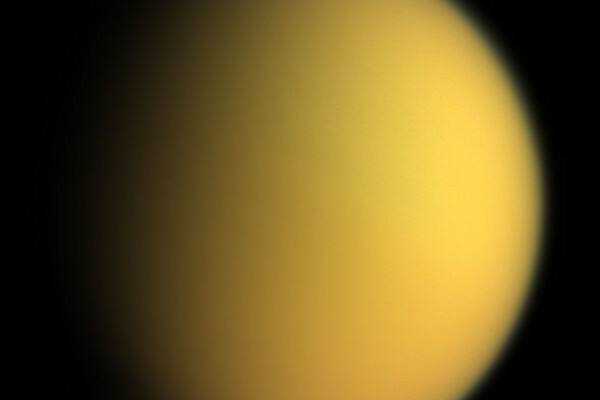 A rather disappointing start to the dream of finding life on Titan. However, recent simulations suggest that some molecules based on nitrogen might be viable alternatives to forming lipid-like cell membranes in conditions similar to those on Titan. Vinyl cyanide was the most promising of these molecules. Until the work by Palmer, there was no conclusive evidence that it existed on Titan. Palmer and her team used archived data from 2014, taken from the Atacama Large Millimeter/submillimeter Array (ALMA), to find it. ALMA is a collection of 66 radio telescopes, located in Northern Chile, working together to peer into the abyss. Every molecule absorbs and emits light at a certain frequencies, creating an emission fingerprint unique to that molecule. The ALMA telescope was able to record emissions from Titan. Palmer looked at these recorded emissions and compared them to a database that contains emission data from every molecule tested in labs on Earth. From these comparisons, she found the first conclusive evidence of vinyl cyanide. But don’t open the champagne yet...the presence of vinyl cyanide in Titan’s atmosphere does not automatically mean life will arise. First the vinyl cyanide must come together to form a cell-like membrane, and this can only happen in a liquid. Currently, scientists can only place vinyl cyanide 200km above the necessary ethane and methane oceans on the moon's surface. But the scientists argue that there is so much vinyl cyanide in the atmosphere that it might solidify and rain down onto Titan’s lakes and seas. Even then, the hypothetical possibility of vinyl cyanide in Titan’s seas and lakes does not a cell-like membrane make. Furthermore, these membranes wouldn’t necessarily be functioning cells and there are no studies looking at how molecules that carry heritable information, like DNA, behave in ethane and methane at sub-zero temperatures. How did early life evolve?